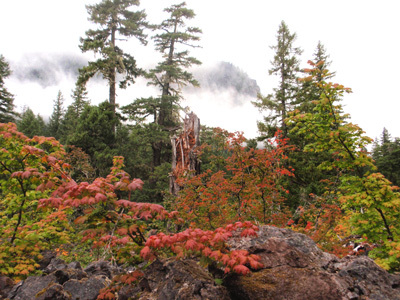 The stunning contrast of red vine maple, lava rock and old-growth forest make the McKenzie-Santiam Pass Scenic Byway a favorite drive for leaf peepers. Are you looking for some delightful autumn drive ideas? October is the best month to take glorious photos of changing leaves in Oregon. Travel along the McKenzie-Santiam Pass Scenic Byway to see vibrant color in old-growth forests, pastoral river areas, and historic lava rock formations. Take a leisurely drive on the Historic Columbia River Highway to experience brilliant colors next to a wide variety of waterfalls and breathtaking views of the Columbia Gorge. Avid photographers will appreciate the Cottage Grove Covered Bridge Tour Route. Some of the most picturesque fall shots can be found on this scenic route, which showcases the largest collection of covered bridges west of the Mississippi. Choose the Rogue-Umpqua Scenic Byway to take in views of Tokatee Falls, White Horse Falls, the Rogue River, Diamond Lake and world-famous Crater Lake. These are just a few of the scenic drives, highways and byways to be found in Oregon. Find more Oregon Scenic Byways and tour routes. Whichever trip you choose, take your time and enjoy the ride. This entry was posted in Favorite Fall Trips, Trips and Tours and tagged Columbia River Gorge, covered bridges, McKenzie-Santiam Pass Scenic Byway, scenic drives by Travel Lane County. Bookmark the permalink.